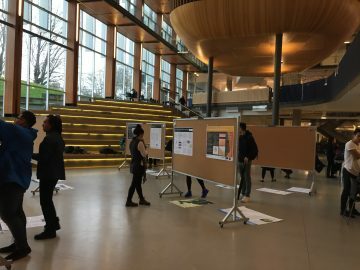 This year, students in KIN 464: Health Promotion and Physical Activity completed semester-long group research projects with a number of community partners (including the City of Vancouver Active Transportation Unit and UBC Athletics and Recreation). Their projects explored a variety of topics related to the promotion of active transportation (cycling) and campus recreation. Their engaging research was on display in the AMS Nest on April 5, 2018, thanks to Dr. Andrea Bundon, who organized the event. Students were there to showcase their research, answer any questions, and review their poster with the participating judges. On April 6, 2018, the students took their posters to City Hall, to present their work at Hubbub 10 – an event that showcased projects by post-secondary students across the city. This marks the first time the KIN 464 class (this year with 117 students) has been involved in community-based research projects. This event was made possible by funding from SEEDS Sustainability Program and the Center for Community Engaged Learning. Thank you to our partners on the projects – the City of Vancouver’s Active Transportation Unit, UBC Athletics and Recreation, SEEDS, and City Studio. Thank you also to our judges: Fran Harrison, Kathy Manson, Negin Riazi, Meaghan Toll (School), Kathleen Simpson (SEEDS), Kavie Toor & Mike Tan (UBC Athletics and Recreation), Matt Dolf (UBC Wellbeing), and Mike Zipf (City of Vancouver). KIN 464 Students setting up their posters in the AMS Nest.